FLORIDA, United States, Thursday August 31, 2017 – Irma is rapidly intensifying over the eastern Atlantic, and is now a Category 2 hurricane that forecasters say will become “an extremely dangerous hurricane” in in the days to come. 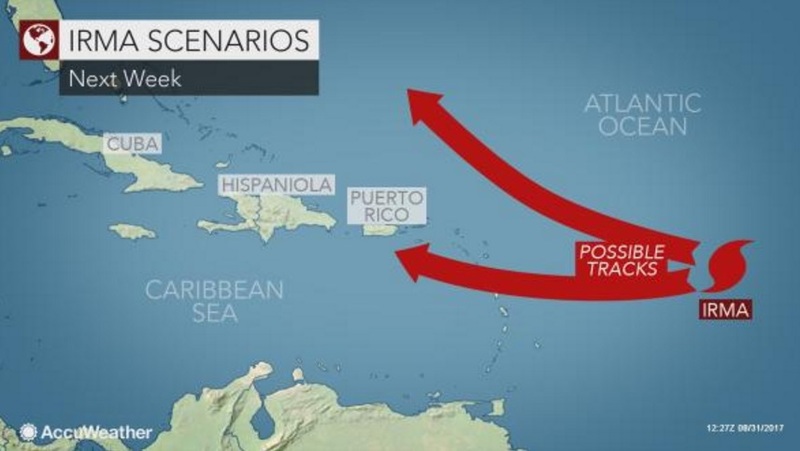 Although it’s still too soon to predict a direct strike, residents of the Eastern Caribbean are being advised to monitor the progress of Hurricane Irma closely as it could head their way. As of 11 a.m. Hurricane Irma, carrying maximum sustained winds near 100 miles per hour, was located about 1,845 miles east of the Leeward Islands, heading towards the west northwest at near 17 miles per hour and expected to continue moving in that direction through early tomorrow, before moving westward on Saturday. “Irma is forecast to become a major hurricane by tonight and is expected to be an extremely dangerous hurricane for the next several days,” the National Hurricane Centre (NHC) in Miami said.